“I think my dog has autism” was my first thought when I saw my puppy standing in front of me with sad eyes, unwilling to play or do anything. To love means above all things to accept and value those who we love for the things that make them unique and extraordinary. In the life of every dog lover there are always challenges to overcome, but even more so when it comes to giving all the care and attention required by those puppies with special needs. The Merriam-Webster dictionary’s described it as a disorder that affects social abilities “characterized by impairment of the ability to form normal social relationships, by impairment of the ability to communicate with others, and by repetitive behavior patterns.” However, autism is not a condition that only affects people. It can also afflict dogs. Challenges with social skills: Set of capacities that allow developing a repertoire of actions and behaviors that make people succeed in their social relationships, through the ability to put themselves in another person’s shoes. Repetitive behaviors: Although some experts point out that Repetitive Behaviors can be beneficial for autistic individuals, as they help them manage frustration; The RB can incapacitate them as they are unable to stop themselves even in the face of damage: grinding their teeth until they fracture, for example. Speech and nonverbal communication: Due to difficulties in code processing, emotions and interactions, communication and language development is a challenge for people with autistic disorders. We now know that there is a broad range of autism types, caused by different combinations of genetic and environmental influences. Well, now that we understand what it is, how does canine autism work? Veterinarians prefer to call this condition “canine dysfunctional behavior” instead of canine or dog autism, even when the symptoms are almost the same. The reason is that the science behind this behavioral rareness is still in diapers as the medical community doesn’t fully understand this. There are not enough studies or researches that can tell for sure what this autism in dogs is about, leaving us in the shadows. Isn’t a surprise to see veterinarians reluctant to diagnose this rare condition, as it would be irresponsible to say this being 100% sure. Even though there are no official studies on this condition, according to some scientists that have been studying the mirroring neurons in dogs’ brains concluded that the dogs that presented the symptoms lacked those neurons and decided that those missing neurons are precisely the cause of the autism in dogs. 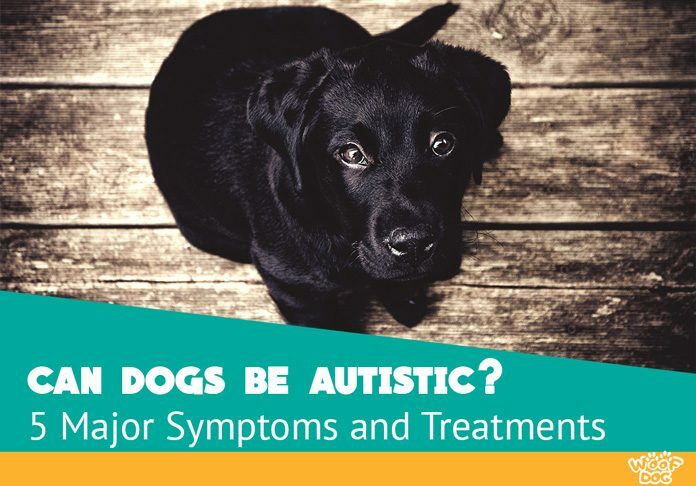 As this would be a neuronal difference, the dogs can’t “get sick with autism.” The dog would have to be born with this condition, inherited from a relative, to present these symptoms. Nevertheless, the cause has not been scientifically proven yet, and it remains unknown. Christian Keysers from the department of neuroscience at the University Medical Center in Groningen explains how mirror neurons function in “Mirror Neurons” an excellent article published in Current Biology magazine. Keysers defines these neurons as “multimodal association neurons that increase their activity during the execution of certain actions and while hearing or seeing corresponding actions being performed by others.” This information would explain the odd behavior in dogs affected by this condition and therefore the symptoms. Watch out for these five major symptoms. Dogs with this affection usually have trouble having social interactions with other dogs and people. Your dog could ignore when you call it or feel weird around other dogs. Also, you could notice he doesn’t usually engage in everyday situations such as playing, eating and even going for a walk. The dog won’t communicate its feelings as any other dogs, as you may see she acts in weird ways to express happiness or fear. They also can get very unpredictable. And, did you know about personalities in people and dogs? Well, autistic dogs seem like they don’t have a personality at all, as some of them don’t show any sign of character. This dog can display peculiar behaviors. These conducts are highly related to the ones autistic humans’ show, such as staring at stuff, avoiding people and objects, running or staying still without any reason. As they are irrationally afraid of some things, they usually don’t like new things, toys, people, and other pets. You can’t know what the dog is thinking or feeling because it doesn’t show those emotions correctly. Therefore they can get scared randomly, making them avoid places and people that don’t present any threat to them. They may retreat and hide unexplainably. They can also present Obsessive Compulsive Disorders, such as repetitive and pointless actions. Watch out for routines that involve this repetitiveness. If your dog gets mad or sad because you put the food bowl three inches to the right, you might be just sighting the wonders of OCD. Because it doesn’t behave normally, the dog can stay still and appear languid and indolent. You could think your dog is sick because it doesn’t show any interest in anything and you may consider it’s depressing. Autistic dogs can be tagged as lazy as they don’t want to play or do anything fun. Like autistic children, dogs with autism feel everything differently. They link physical and sensorial stimuli to wrong emotions, and that makes them react in off the wall ways as if they were hurt just by the gentle touch of their owners. This behavior can be disheartening as you don’t know the cause of this sad reaction. It’s important to know that the dog is not acting correctly and it doesn’t mean the owner is doing something wrong. Since when do they show the symptoms? As said before, dogs can’t get sick with autism, and they’re born with the condition. Therefore, they present the symptoms since they are puppies. As with human children, it’s essential to know if your dog has autism to begin treatment as fast as possible. It’s a condition, not a disease. As said before, dogs are born with this condition, is genetic and built-in their systems. It cannot be “cured.” Nevertheless, it can be treated to palliate the symptoms. Medicine. The treatment with medications doesn’t mean your dog will stop having autism, but it can help to ease and lessen the symptoms, the same they do with humans. For this, your veterinarian may prescribe Fluoxetine which is already being used to treat OCD and autism problems in people and dogs. Medical treatment would tranquilize your dog and prevent aggressive behaviors. Secure and safe environment. Autistic dogs might be afraid of almost everything and react in weird ways. It would be best if you ask your vet for a visit, so your dog doesn’t get nervous and anxious around other people, other dogs, and an unknown environment. A situation like this could be particularly stressing for a pet suffering from autism. Make sure they have a quiet, safe space just for them so they can hide every time they need to. If a pup doesn’t have a way to retreat, his stress will be enhanced. This space could be a crate, a kennel, a reserved or solitary spot in the house, he could even pick that place, and the best you can do is respect it. Anti-stress life. Avoid any situation that could cause your pet any stress or anxiety. If the dog doesn’t like to be petted, don’t pet it. If she or he doesn’t like to meet people or dogs, let it be… You got to have common sense. Being gentle to people with anxiety helps them calm down, the same happens with dogs. Think of people having breakdowns and going easy after being hugged. Well, Thundershirt created a great vest that can help dogs with anxiety. Physical Therapy. Massages and physical therapy for dogs are being less uncommon every day. That is good because as said before, gentle pressure is great for anxiety. Dogs respond very well to physical therapy and massages just like humans do. Exercise. This is the answer to everything in life: exercise! If your dog has plenty of exercises, she (as humans) will have less stress and anxiety, and she will be happy (maybe, you can’t know for sure) to move the paws around. There is no specific treatment for every dog as every one of them is a different individual. If you think your dog has autism or your dog presents autistic behavior, just run to the vet, or better: make the vet run to you. Are certain Breeds Prone to this condition? Certain breeds, like Bull Terriers and German Shepherds among others, can display OCD characteristics like compulsive-tail-chasing. The Mayo Clinic, referring to autism in humans, talks about the causes saying that “for some children, autism spectrum disorder can be associated with a genetic disorder, such as Rett syndrome or fragile X syndrome. For other kids, genetic changes (mutations) may increase the risk of autism spectrum disorder.” The X syndrome can affect dogs too, leading us to Bull Terriers and their obsessive compulsion for tail-chasing. Though at first, it looked just as a pure obsessive-compulsive disorder, after comparing the genetic code of this breed to others that also showed OCD behavior, they found something incredible… The Bull Terriers didn’t have the mutation that usually triggers the obsessive-compulsive disorder in the other dogs. Chasing the tail is not the only compulsive behavior Terriers show, they also have other weird attitudes, and guess what? They are autistic-like behaviors. Prominent forehead, elongated face, large ears and high-arched palate: That’s the description of a Bull Terrier. If this isn’t enough coincidence, research published in 2014 by scientists at Tufts University School of Medicine, showed that Bull Terriers and human autists share something interesting: they both have elevated levels of neurotensin and corticotrophin releasing hormone, giving medicine a lot to think. The first time veterinarians thought about autistic dogs was 1966, because they found dogs presenting the symptoms that were similar to the ones humans show. But it was until 2015 when the American College of Veterinary Behaviorists, introduced the Veterinary Behavior Symposium, in which they talked about the study made by Dr. Nicholas Dodman. The research showed how Bull Terriers exhibited the symptoms spoken above such as prevalence in males, trancelike and unpredictable behaviors, aggressiveness and phobias which led scientists to consider the canine form of autism. Future studies are expected since the raised awareness of this condition. We talked about autism a lot, but did you know autistic children can also benefit from having a dog? Paws with a Cause speak of assistance dogs, specifically service dogs that help alleviate the symptoms of children with autism. Can you keep an autistic dog? Of course, you can keep it! Autism in dogs can be a challenging condition but, if you get to discover that your dog is autistic, be patient. Dogs with autism can still have a high-quality life with the right treatment and plenty of love. Remember, your dog has a condition, but that doesn’t mean it doesn’t deserve the right to love you and be loved back. What It Means To Be A Flat-Faced Dog? This article is really cool! I thought only people could have autism! Really interesting. And what I liked best about this article was nothing in here was offensive to me. I have autism, and whenever I read about it online some of the generalizations really make me angry. None of that in here. So interesting! Thank you for this article, and for your comment Dana. Very helpful in understanding and managing our rescue dog w/autism. My Great Pyrenees was a swimmer pup. I knew at 2 weeks of age that he was different from the rest of the litter of 6. He was always delayed developmentally about 2 weeks behind the other pups. I did physical therapy with him to get his legs under him properly and have raised him with lots of patience and understanding. I have worked with him on “trust” if he can’t trust something then he can trust me. It has helped a lot. I would say that Berkeley is mildly autistic, but definitely on the spectrum. he had his first seizure at 3 yrs 2 mos and 2 episodes 6 months later. He is on phenobarbital and that has helped his seizures a lot and has changed some of his autistic behaviors. It has been a very interesting relationship. I love him dearly.